Delta Shoal and Sombrero Key Reef: Delta Shoal and Sombrero Key Reef south of Boot Key are prominent shelf-margin reefs (Fig. 68B). 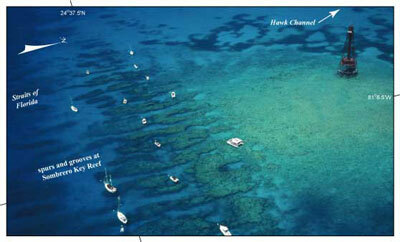 Conspicuous elongated zones of storm-transported reef rubble have accumulated behind both (Fig. 75; see Benthic Ecosystems for Tile 4). In 1989, sands at Sombrero Key Reef contained some of the highest coral-grain percentages (>60%) found on the outer shelf (Figs. 61, 63). High coral-grain percentages have been correlated with high coral mortality and are believed to be a direct result of an abundance of skeletal coral and increased bioerosion by boring and grazing organisms (Lidz and Hallock, 2000). The extensive spurs and grooves at Sombrero Key Reef (Fig. 76) are prime examples of buttresses common to all Florida Keys Holocene reefs that faced persistent waves. A comb-tooth structure best developed on the windward side of reefs, spurs and grooves consist of elongate, seaward-extending fingers of interconnected corals separated by channels a few meters wide and deep, and filled with moving sand (Maxwell, 1968). In Florida, spurs vary in width from 7 to 60 m and extend to depths of 30 m (Shinn, 1963). Coring and excavation by ship groundings have revealed that the primary builder of Holocene spurs was the branching elkhorn coral, Acropora palmata, and that the spurs are constructional rather than erosional in origin. This particular coral species grows in high-energy surf zones in less than 5 m of water. Thick stands of A. palmata once flourished in the keys (Fig. 9) and formed spurs on outer-shelf reefs such as at Grecian Rocks as well as on shelf-edge reefs. Sombrero Key Reef is but one of many at the margin with spur-and-groove buttresses. Coring has also shown that unlike most reef-building corals, those constructing spurs did not always develop on hard, sediment-free substrate (Shinn et al., 1981). In some areas such as at Looe Key Reef, spurs grew landward over carbonate sands (Lidz et al., 1985). Because of the high growth rate of A. palmata, spurs of this species accumulated rapidly. The faster the spur growth centers developed, however, the more efficiently they trapped sand that in turn prevented lateral expansion (Shinn, 1963). Spurs thrived until corals became overcrowded. Constrained by position of sea level overhead and sand-filled grooves at either side, spur-building corals eventually succumbed for lack of space. Where overcrowding was not an issue, the primary cause of death was influx of inland water from Florida Bay (e.g., Shinn, 1963). As on other Florida reefs, stinging corals cap skeletal remains of the Holocene spurs at Delta Shoal and Sombrero Key Reef today. Like terrestrial forests, coral reefs progress through recognized phases or shifts in community structure in response to changing biotic and/or environmental conditions. Encrustation of skeletal substrate by coralline red algae, octocorals (alcyonarians and gorgonians), the fleshy zoanthid Palythoa, and hydrocorals Millepora complanata and M. alcicornis is found on coral reefs that no longer sustain live reef-framework builders (Fig. 16A, 16B, 16C, 16D; Marszalek, 1977). Though spurs throughout the keys harbor fairly diverse communities, as do the outer-shelf reefs, stony corals are no longer growing and framework is no longer accreting (Fig. 3A, 3B, 3C, 3D). The few reef-framework-building corals that survived and were alive as recently as 30 years ago have since been replaced by small sparse individuals, and the reef substrate supports the macroalgae, stinging corals, sea whips, and sea fans typical of hardbottoms. The decline may in part be natural but is clearly being abetted by increasingly pervasive anthropogenic effects (e.g., Environmental Protection Agency, 1992). Despite notable coral decline at Sombrero Key Reef over the past 40 years, spurs and grooves at this and other reefs remain popular sites for snorkelers and scuba divers (Fig. 76). The Sombrero Key Light stands on a broad shoal behind the spurs. The shoal area was a sand island in historic times; hence, the word "key" in the name of the reef.